An American Original, Still Going Strong! 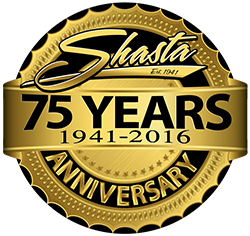 Since 1941, Shasta has been an important player in the ultimate American Dream; the freedom and desire to roam, explore and enjoy well earned leisure time with the people we love. CHOOSE AN RV THAT IS RIGHT FOR YOU. Choose from one of our travel trailer or fifth wheel brands below. Perform general maintenance and routine tasks on your Shasta unit. Get 24/7 roadside assistance FREE for one year from purchase date on new RVs! View and download manuals from some of the components we use in our RVs.